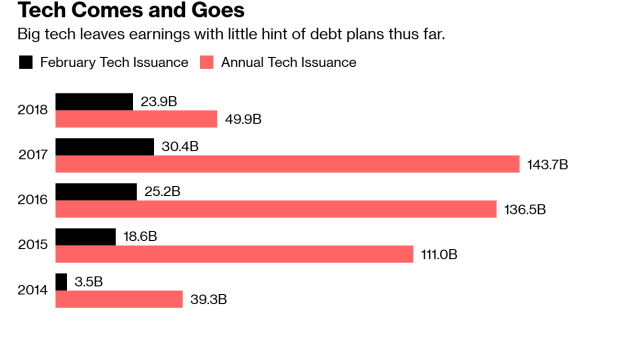 (Bloomberg) -- Big tech earnings came and went without so much as a hint of plans for corporate bond sales this year, setting up a February drought that hasn’t been seen in years. Technology heavyweights such as Apple Inc. and Microsoft Corp. have made February typically the month of choice to borrow money in the investment-grade market, according to data compiled by Bloomberg. The shortest month on the calendar saw the most or the second most tech issuance over the last five years, accounting for nearly 50 percent of the sector sales in 2018. But things look set to change this year as companies have more money on hand after tax legislation made it cheaper to bring back cash from abroad. “The technology sector has mostly passed on the primary market since new tax legislation was rolled out in the beginning of 2018, funding maturities with cash on hand, a dynamic we expect to persist,” Bloomberg Intelligence analyst Robert Schiffman said. One of the drivers of corporate bond issuance over the past few years has been historically low interest rates, which began to change last year as the Federal Reserve tightened policy. But what had more of an impact was U.S. tax reform passed in late 2017, which included a provision allowing companies to repatriate foreign profits at a lower rate. This left many tech companies with little need to borrow. Take Apple for example. The company issued $30 billion of bonds across five deals in 2017, according to data compiled by Bloomberg. Of that, $29 billion went to the company’s coffers for general corporate purposes. Apple, like most other major tech issuers, was a bond market no-show the following year. And the drought seems to be continuing across the sector. Alphabet Inc., Microsoft, Facebook Inc. and International Business Machines Corp. reported quarterly results with little to no indication they would be issuing bonds this year. Technology companies may not even need to refinance existing debt as the sector has more than enough cash to address upcoming bond maturities without issuing any new securities, according to Bloomberg Intelligence. The lack of issuance has helped narrow high-grade bond spreads. For instance, Alphabet has more than $22 billion in free cash flow and hasn’t recently issued any new debt, creating scarcity that’s pushed its credit to trade at a premium to peers like AAA rated Microsoft, according to Schiffman. Some tech companies may still need to sell bonds this year. There’s $45 billion of investment-grade technology bonds maturing this year and several acquisitions that still need to be paid for. IBM may tap the debt market to pay off the $20 billion bridge loan it took to fund part of its Red Hat purchase last year. Broadcom is also in debt with $18 billion in outstanding loans from its purchase of CA Technologies. --With assistance from Brian Smith and Molly Smith.